NYC, 05/21/2019, 11:30AM. Mary Poppins Returns (2018): The Magical Nanny. 130 min. Director: Rob Marshall. Starring Emily Blunt, Lin-Manuel Miranda, Ben Whishaw. Mary Poppins Returns received four Academy Award nominations for Best Original Score, Best Original Song, Best Production Design, and Best Costume Design at the 91st Academy Awards. It was chosen by both the National Board of Review and American Film Institute as one of the top ten films of 2018. 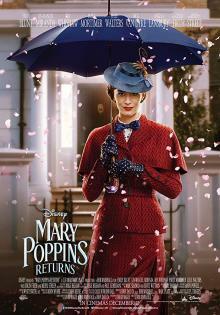 It is based on the book series Mary Poppins by P. L. Travers.